Reality by Rach : Throwback Video of the Week! Wow, so it's been WAY too long since I've posted an installment of Throwback Video of the Week! So to make up for it I'm coming back with with a bang or rather a Boy Band ! But not quite the typically boy band you might be thinking of. 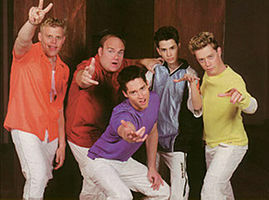 This 'throwback' features the Mtv parody Boy Band that later, due to popularity became a real Boy Band, 2gether. Their single from the movie 2gether Calculus (U=Me=Us) became an instant hit and is hilarious! Boy do I miss the old days of Mtv, this concept was genius and spot on with their impersonation of a popular 90's Boy Band! Simply put, old school Mtv + a fake Boy Band= a damn good time! Enjoy!